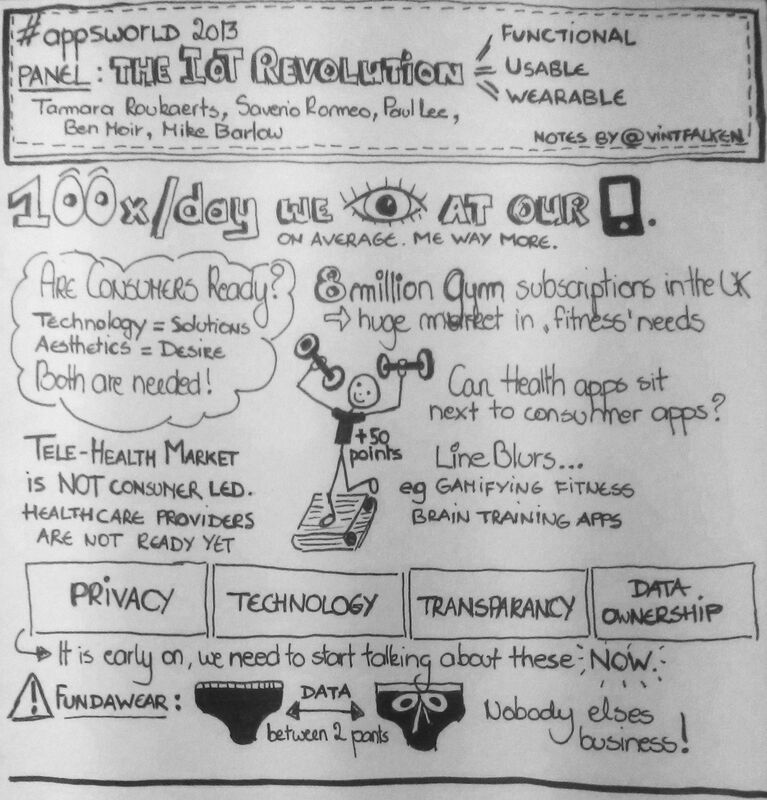 Notes from the AppsWorld Europe 2013 panel “The Internet of Things Revolution – Functional, Usable, Wearable” with Tamara Roukaerts, Saverio Romeo, Paul Lee, Ben Moir and Mike Barlow. In this excellent article from Nature Biotechnology written by people at PureTech, we have the chance to get an overview of this new exciting field: Digital Medicine. This convergence of technology and health will lead to several transformations: disease management, research, clinical trials, medical practice,… A new era is beginning! However, opportunities are doubled by challenges. We need to tackle the lasts to profit from the firsts. Why do we use digital medicine instead of digital health? According to the authors, digital health is too broad as it also includes apps and products not medically validated but simply focused to enhance people’s wellness and wellbeing. 1. Continuous and remote monitoring. A tool to detect disease earlier leading to lower healthcare costs. 2. Digital phenotype. A additional layer of information enabling the construction of more accurate disease models in order to better understand them. 3. Remote disease management. Chronic disease management will be nearly effortless and the lack of data gap will allow doctors to improve their medical follow-up of patients. 4. The connected patient. The empowered patient. The engaged and sharing patient. Communities of patients. 5. Interpreting the data torrent. The challenge of integrating large and heterogenous datasets could be solved one day with powerful algorithms and machine Learning. 6. Security and privacy. The obtention of the patient’s consent is crucial and should be much simpler than today. 7. Opportunities and challenges. Increased scientific evidence but reimbursement issues, new field of research based on wearables, changes to patient-doctor interactions, integration of patient-specific data by the doctor. Digital medicine is unavoidable and doctors will have to integrate this trend in order to optimize their relationships with their patients by empowering them and maintaining a two-way discussion toward a unique goal: better patient outcomes. Have a look at my posts on this topic. This entry was posted in Corporate Strategy, Digital Health, Drug Development, Health Systems, Insightful, Trend Box and tagged Big Data, Corporate Strategy, Digital Health, drug development, Health System, Innovation, Medical Technology, patient-centric. Bookmark the permalink.